The integration of European--indeed, global--capital markets has been under way for quite some time. However, the adoption of the single European currency crystallises the process, solving many old problems at the same time as it creates new challenges. In this wide-ranging book, 28 notable practitioners and academics--including economists, regulators, and lawyers--pool their prodigious resources to analyse the current and future issues affecting investment, conduct of business rules, stock exchanges, trading, and company law. Originally designed as a research project, this finished work was developed from individual research and first drafts through group discussion to a final interconnected achievement. Since the authors met at a conference in Genoa in November 2000 on the initiative of four major European law faculties, a number of pertinent regulatory developments have taken place, notably the Lamfalussy Report and the adoption of various proposals by the European Commission. Analysis of the impact of such recent and ongoing events has been incorporated into this final text. 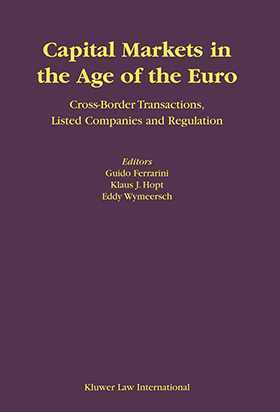 As an authoritative guide to the likely development of investment practices, regulatory measures, and financial and company law in the coming years, this volume is unmatched for its penetrating analysis and prognosis. No investor, company lawyer, or regulator can afford to leave it unexamined.